Masala chips, are pretty quick to make and gives the humble chip an amazing lift. Give it a go and let me know what you think. Fry the onions in oil until translucent. Add garlic and green chilies and cook for 30 seconds. Add the tomatoes, tomato paste, salt, pepper and chill powder and let cook for 4-5 minutes. 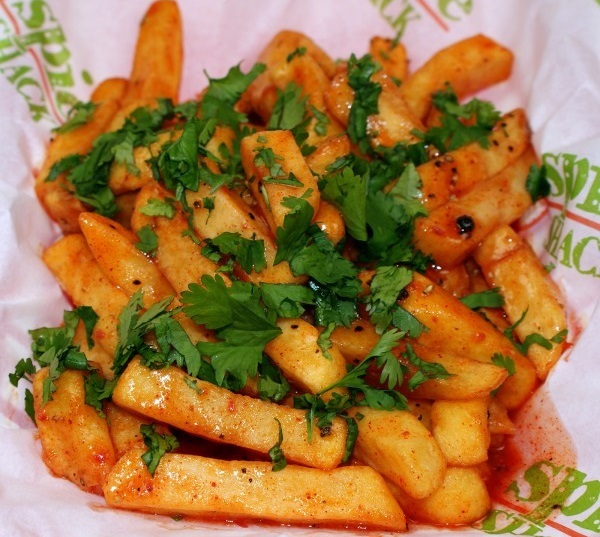 Add the fried chips, stir together and garnish with chopped coriander leaves. Serve warm. Tips: Slice the potatoes, dry them with a kitchen towel, fry for 3-4 minutes. Take out on to a paper towel and let cool for 5 minutes and then fry again for just 1-2 minutes. I find that this makes it crispy and retains less oil.